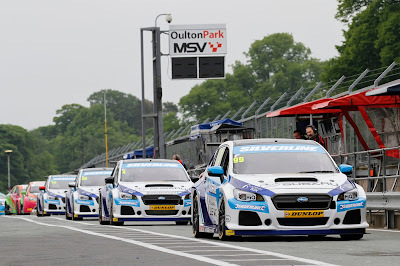 The Silverline Subaru BMR Racing team then backed that up when they entered the history books at Oulton Park at the weekend with Double Champion Colin Turkington scoring the team’s first Subaru win in the Dunlop MSA British Touring Car Championship. With all four cars having shown good pace in the two Saturday morning free practice sessions, the team went into the afternoons qualifying session feeling confident of a good result. Colin Turkington delivered the goods producing a blistering 1m:26.264s lap around the 2.26 mile Cheshire circuit, setting the team’s first Silverline Subaru pole position. Jason was running in 2nd place for the first part of the session and eventually qualified in an impressive 6th with a time of 1m:26.366s. James set the 18th quickest time with Warren qualifying in 23rd and just 1.025s adrift of Colin’s benchmark time. For the opening race of the weekend Colin made a great start from pole position fighting off challenges from Sam Tordoff in the BMW during the opening stages, before stretching his lead with a lights to flag victory and making it the team’s first ever win in the Subaru Levorg GT sports tourer. Jason endured a great battle with Honda’s Gordon Shedden after finally making the move on lap 12 and placing him in 3rd position, making it a double podium for the Silverline Subaru BMR Racing team. Warren and James both drove a great race and finished in 17th and 18th respectively. The team were also handed the manufacturer win that was greatly received by the Managing Director of Subaru UK Paul Tunnicliffe. For race two all four drivers would start in their finishing positions from the opener. With Colin back on pole and Jason set to line up in 3rd, both drivers made a great start but Tordoff immediately took the lead leaving Colin and Jason battling for 2nd. Colin held off Jason and took the place ahead of his team mate in 3rd, making it another outstanding double podium with celebrations all round for the team. Warren brought his car home in 19th as James retired from the race after suffering a hit from behind causing him braking issues. The reverse grid for Race 3 would see Honda’s Matt Neal drawn on pole position with Jason set to line up in 5th, Colin 7th, Warren 18th and James 31st. The 15 lap final shoot out was a great end to the day with an exciting battle for 3rd position between several competitors including Jason and Colin, which lingered throughout the entire race. A last gasp opportunity at Lodge corner would see Jason passing around the outside of several drivers that produced a hat-trick of third place finishes. Colin held onto a fantastic 7th place as both James and Warren pitted dropping them both down the order and as the flag fell Warren crossed the line in 24th with James retiring in pit-lane. Silverline Subaru BMR Racing were awarded the Team Trophy for the weekend. The Dunlop MSA British Touring Car Championship now moves on to Croft in Yorkshire in two weeks’ time (18th & 19th June). Warren Scott commented “Firstly I would like to say a huge thank you to Subaru UK, Jason, Colin, James and everyone in the team at Silverline Subaru BMR Racing along with all of our sponsors for getting us here. I am very proud of everyone involved in the project and everyone should remember that these cars are only six months old and we have just won our first race. We are all absolutely delighted”. 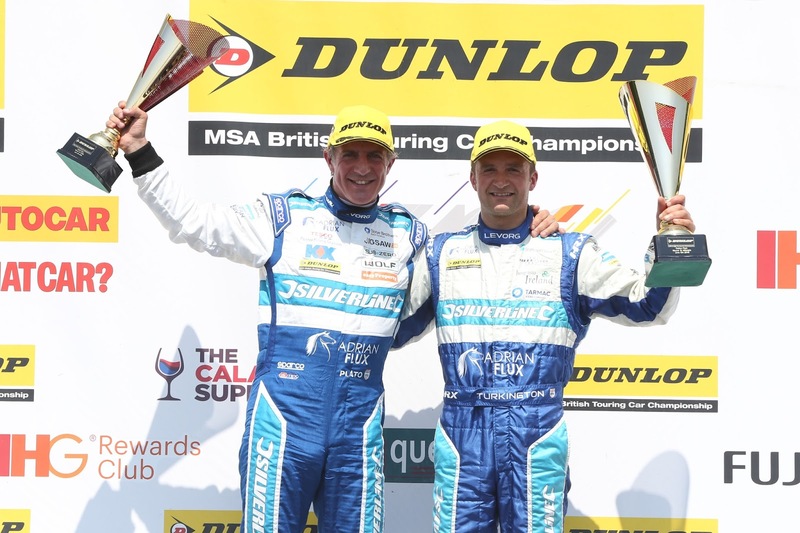 Jason Plato Commented “What a fantastic weekend for everyone at Silverline Subaru BMR Racing. 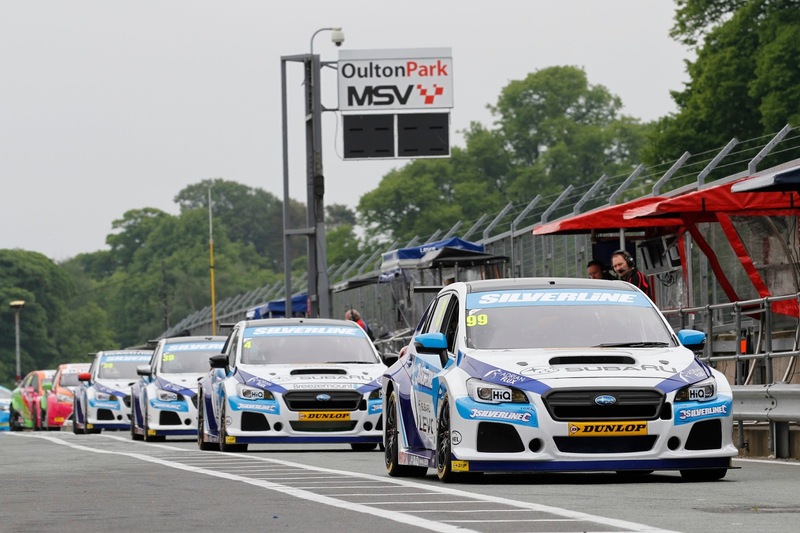 We should be enormously proud of our successes at Oulton Park. We really have arrived in some style. The future is very bright for us all and I can’t wait to get back in the car for Croft.